NASA's Terra satellite passed Tropical Cyclone Bansi on January 13 when it was about 170 nautical miles (195 miles/314 km) north of the Island of Mauritius and a major hurricane in the Southern Indian Ocean. The Moderate Resolution Imaging Spectroradiometer or MODIS instrument aboard NASA's Terra satellite captured a visible image of Tropical Cyclone Bansi on January 13 at 6:25 UTC (1:25 a.m. EST). The image revealed a 12 nautical mile-wide visible eye with high, powerful thunderstorms ringed around it, and spiraling bands of thunderstorms wrapping into the center of circulation. 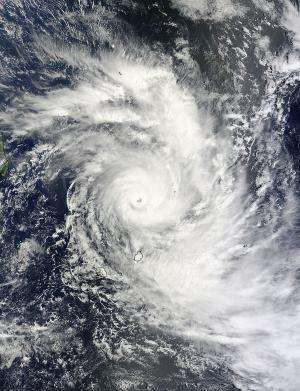 The eye of Bansi appears a couple of hundred miles north of Mauritius. The image was created by the MODIS Rapid Response Team at NASA's Goddard Space Flight Center in Greenbelt, Maryland. On January 13 at 0900 UTC (4 a.m. EST), Bansi's maximum sustained winds had increased to 130 knots (149.6 mph/240.8 kph). Bansi is a Category 4 hurricane on the Saffir-Simpson wind scale. At 0900 UTC, it was centered near 17.3 south latitude and 57.7 east longitude, about 169 nautical miles (194.5 miles/313 km) north of Port Louis, Mauritius. Bansi is moving to the northeast at 4 knots (4.6 mph/7.4 kph). The Joint Typhoon Warning Center noted that slow or near quasi-stationary movement is expected over the next 36 hours due to a weak steering environment. Over that time, some intensification is likely, and the cyclone is forecast to peak as a Category 5 storm on the Saffir-Simpson Scale at 140 knots (161.1 mph/259.3 kph) before starting to weaken. The forecast calls for Bansi to continue moving away from Mauritius and head in an easterly direction over open waters of the Southern Indian Ocean.